In the second half, it got away, won and got closer to the Top 16, EA7 against Cedevita Zagreb, the team coming from two wins and a two-point loss in Piraeus. A streak of four consecutive Euroleague losses was broken and besides the third Euroleague win there’s also the second mini winning streak of the season. The 2-0 against Zagreb in head-to-head games, with a one-game advantage, put Olimpia in safe situation against the Croatian team. Antonis Fotsis played a great game, but there was cheers for everyone, five players scored in double digit, Bourousis does that scoring all his 11 points in the second half. FIRST HALF – Antonis Fotsis is attacking the game scoring seven-point in a matter of minutes, a three, two free throws, a fastbreak finish. Cedevita is up 9-5 after a 7-0 run, but EA7 answer is quick: Hendrix scores six points, including two dunks, one on an alley-oop pass by Langford. After the first time-out is 13-11 Olimpia. A Goran Suton three allows Cedevita to take a 3-point lead but two verry difficult field goals by Langford give EA7 a new tie and a three by Melli, who just enterd the game, gives a 20-18 EA7 lead at the end of first. EA7 goes up by seven twice in the second, first with a Stipcevic three and then with a long jump by Basile. Cedevita run and keep up, a three by Wright, a free-throw by Andric and its’ down by four again, 29-25. Two threes by Ilievski and Green allow Cedevita to surpass. 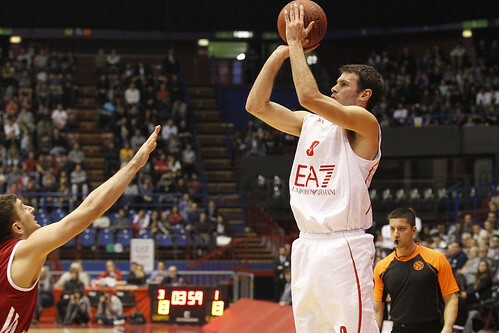 Zagreb takes a 3-point lead again, ma Olimpia weathers the storm and it’s down by one at half-time. SECOND HALF – Omar Cook, scoreless in the first half, makes the three to regain the lead early in the third quarter. After three foul shots made by Gelabale, Fotsis and Hairston make two threes in consecutive possessions to give EA7 a five-point advantage, 47-42. But the decisive run doesn’t stop here, Hairston dunks, Bourousis scores, Fotsis converts a tip-in and when Olimpia is up by 8, Basile and Fotsis again make two threes opening up a big lead. When Bourousis makes two from the line, EA7 is up by 20. 61-41 and turn the fourth period into an exhibition. After four losses, the third win is good to get closer to the Top 16, with a convincing defensive effort and excellent team game.